The links section highlights other things I’ve done that don’t really fit well into the main catagories of the website. The content is updated from time to time, as opportunity and/or creativity strikes. Eventually I will post some early tracks I made with Fast Tracker and Fruity Loops. Until then, there’s this. 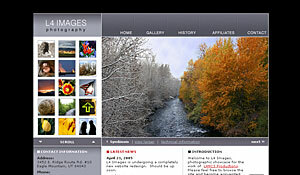 L4 Images is my personal photographic showcase. I’ve never had the time to really make it what it could be, but I hope to update it soon. A simple movie created years ago to play around and learn flash, but our daughter could name the planets before she was three.